Brian Anderson (B.A. ’93) has been calling games for nearly two decades, but he’s getting ready to tackle a whole new broadcasting adventure. Anderson will be on the air for the NFL on CBS — daunting, when you consider that the National Football League averages more than 17 million viewers per game. But Anderson is no stranger to the big leagues: He’s been an announcer for Major League Baseball (MLB), the NBA, the Golf Channel and the San Antonio Missions. 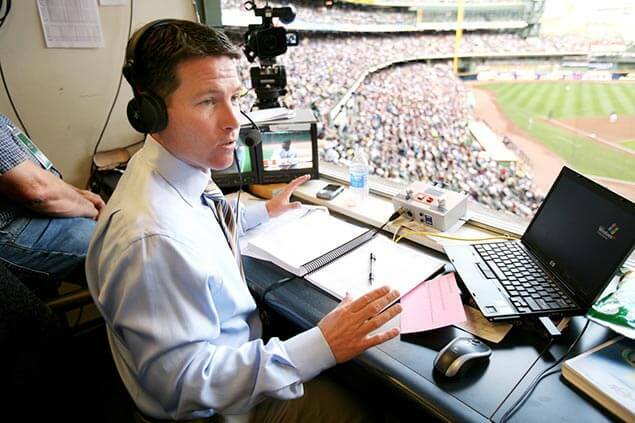 Before getting the call to join the NFL on CBS, he had been a sportscaster for the Milwaukee Brewers for seven years. As a pro broadcaster, Anderson believes it’s his responsibility to keep the games relevant and popular. And if he was ever unsure that he was living up to that charge, an Apple television commercial, called “Game Changer,” removed all doubt. The 2008 ad featured a video highlight of a Brewers game with Anderson calling Ryan Braun’s grand slam. A former Rattler baseball player himself, Anderson recognizes all the breaks he’s had along the way. But those breaks would not have paid off had he not put in the work. As an undergrad, he honed his skills in photography and videography, thinking of broadcasting only as a “plan B” to a baseball career. With his résumé soon to include broadcasting for the NFL, his plan B transformed into an A-grade career. “Being a part of an enterprise like the NFL is thrilling,” he said.